Looking for an easy way to hide your ac unit? 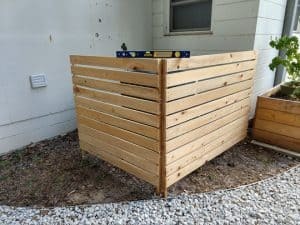 In this article we’ll share what we did to hide ours, and share a few popular ways you can hide your outside ac unit. Once we did it, I couldn’t believe how easy it was. Keep it accessible- You want to make sure that a repair person can get to the unit to make repairs or just regular maintenance. So any structure that you put there can’t be permanent where you can remove or access the unit. Keep it vented- Make sure there is plenty of airflow around the air conditioner. The main purpose of the AC is to pull hot air out from the interior of the house, so you don’t want to make it harder for the unit to do its job. This whole article came up because we recently got a new AC unit. When they installed it, we had them move it a few feet over so that it wasn’t right next to our deck, which was great. But it’s still close to the deck and a bit of an eyesore. In fact, the whole area doesn’t look very appealing, so I came up with a design for a removable fence screen to hide the AC. My main concern with coming up with a design is making sure there was enough air flow around the AC unit. Like the number 2 rule above, you have to have enough ventilation for it. Since it’s brand new, I certainly didn’t want to build anything that would cause it to not work right. Also, from the small amount of research I did, you should have at least 12 inches of clear space around your AC unit. My second concern was for the screen to be removable for yearly service access. This goes back to rule #1 above. I’ve seen several designs that have use lattice for the screen but I’m not a big fan of the lattice look. 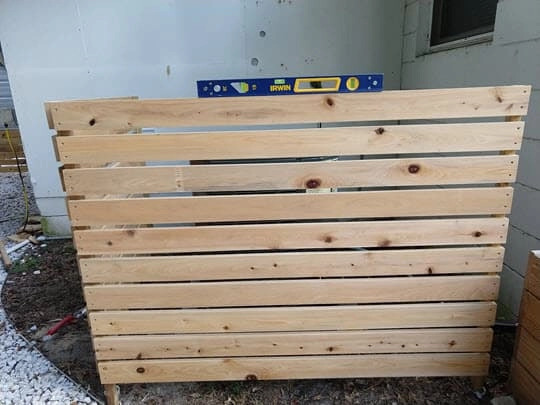 Since my fence is a horizontal slats made with 1×4 cypress, I thought I would mimic that style for my AC fence. 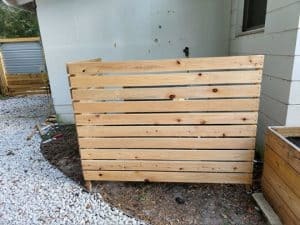 Bonus was I had scrap cypress lying around the house. 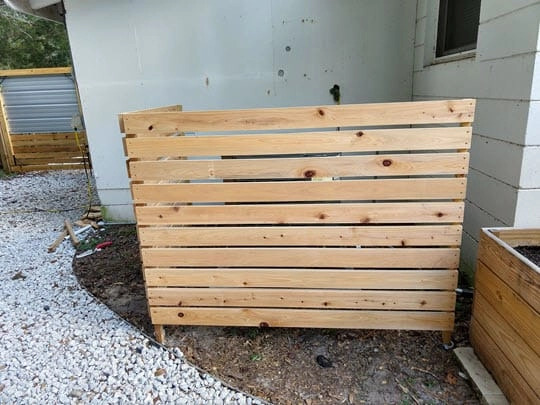 With the leftover cypress boards I decided to build two horizontal slat frames with 2×2 pressure treated legs. The legs will be longer than the slats and sit inside (2) 2 inch diameter PVC pipes buried in the ground. The following materials is used for one screen that measures 60 inches wide and 48 inches tall. Honestly, I was lucky because I had a lot of the materials and tools to build this. The total time it took me was about 4-5 hours. If I had to get the materials, it would be about 6-7 after going to the hardware store. I used a miter saw to cut all my pieces, even the PVC. 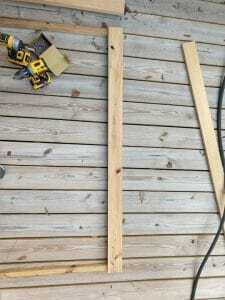 To cut my slats I measure and cut one slat then I use that as my guide to cut the rest of the slats. 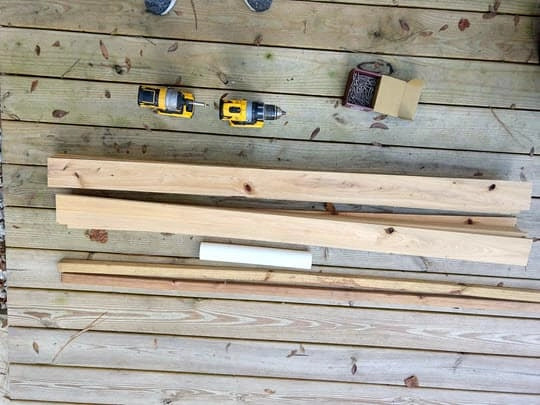 For me, it’s faster and more accurate than breaking out the measuring tape for each cut. To make the screen, the first slat is laid across the top of the 2×2 legs. 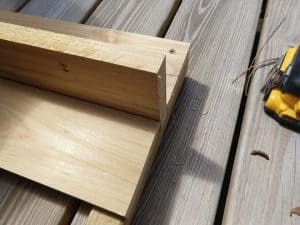 I place it along a flat surface with the legs underneath the slat. 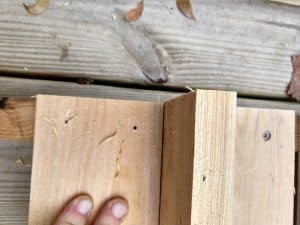 Once you line up the first slat even with the side and top of the leg, I made sure to pre-drill the wood since the holes are close to the edge and cypress will split if you drill too close to the edge. After pre-drilling two holes, i screw in 2 1 ⅝ exterior screws per side. 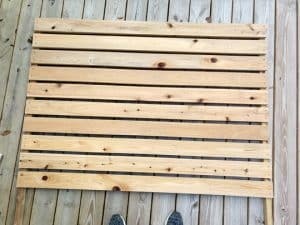 I then use one of the slats to create an even ¾ space between slats. Once you get the first slat on, the others go on very quickly. This is what the final one will look like after you put on the boards on. Once I found the spots in the ground for my PVC, I took a mini sledge to pound the PVC into the ground. If you’re lucky, you won’t find any roots. If you’re like me and do find a root, I used my hand spade to cut the roots though you could also use a small pruner if root is close to the surface. Once it is root free the key is to pound the PVC deep enough but still be able to pick it up and remove the dirt from the pipe to have room for the leg to sit 12 inches inside to make it sturdy. I actually did one PVC piece at a time to verify the spacing for the second leg. Once you have both PVC pipes in the ground it’s time to insert the legs. When I inserted my legs one side was higher than the other. I live in Florida with very sandy soil, so I knew I could take my mini sledge and hit the top of the high side 2×2 to get it a little lower. I couldn’t get it even so I took the screen legs out of the PVC and put a bit of dirt into the low side PVC. After a couple of tries, I got the screen level. On my second screen I left my legs longer since I didn’t want to have it be shorter than my first screen. Once you get the PVC buried, now you have to get the second screen even with the first. I inserted my legs into the PVC and then took the measurement of the difference between the first and second screen. I then cut my leg on the bottom the same difference. It took two tries to get the second screen even with the first screen and level. Then I noticed that my second screen had more movement than my first screen so I installed some spare stakes in between the PVC and wood legs to limit the movement. I think the screens came out really well and I love being able to make something useful out of scraps lying around the house. I can’t wait to get some plants in front of the screens. Now, if the way we did it doesn’t suit your needs, here are the top 5 other ways to hide your AC that I liked. We almost went with this design because our neighbor has a lot of bamboo growing right beside us. He (and we) trim this back often. We chose not to because it didn’t go with the look of our backyard. But really super easy and cheap to get it done if you like that look. You could even step up the design by having a frame for the bamboo to go into. 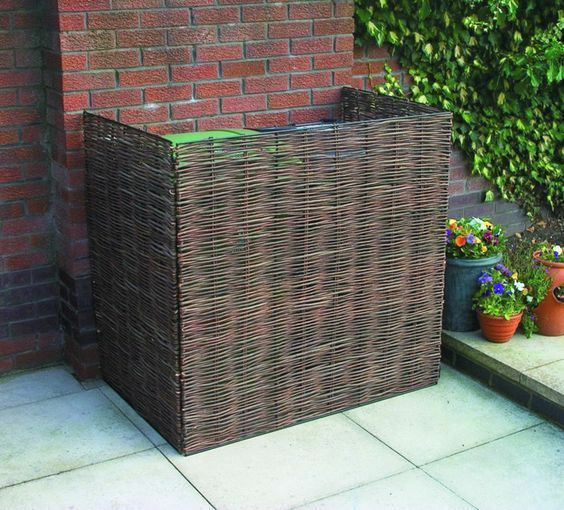 A 3-sided bamboo cover for your ac condenser or your trash receptacles. Can be made by making a metal frame and attaching our bamboo material to the metal frame. This is really an easy and cute design. It would go really well if the rest of your backyard is fenced with picket fencing. 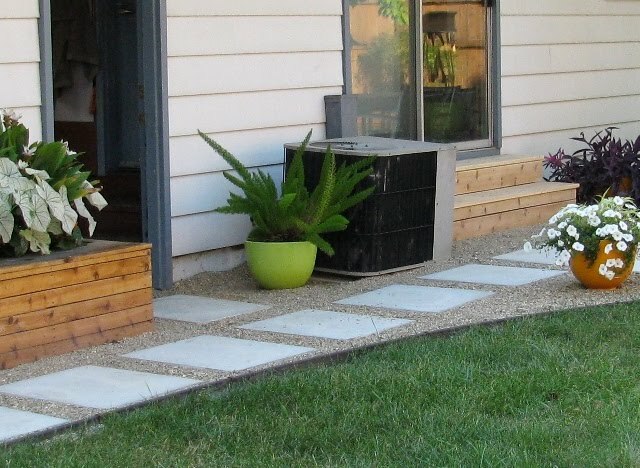 Like I said earlier, I’m just not a fan of lattice fencing, but it’s a popular way to hide the ac and there are some looks that aren’t bad at all. This is similar to ours, but the design and construction is more intricate. If you’re looking for an artistic flare, then you could do something like this and use scrap woods as well. hide that ugly AC unit! This is very intricate and artsy. 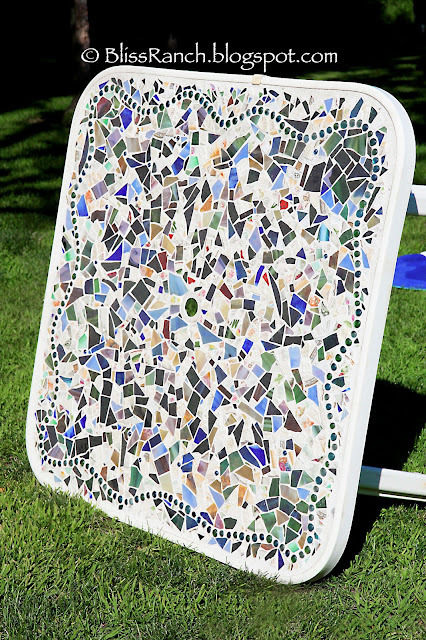 You could make a mosaic out of broken glass and grout. It’s a more solid structure and something that will take a little more time, but it really hides the whole ac. 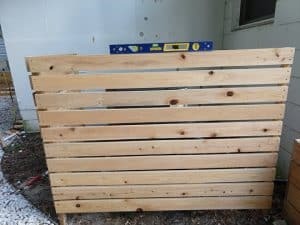 DIY Furniture Painting, Vintage Junk, Reuse Re-purpose Recycle, crafts, Home Decor, Yard & Garden. So that’s how we hid our AC unit in a day. It’s funny because that area has been such an eye sore for the 2 years we’ve had the house and it was so easy to put together. What about you? 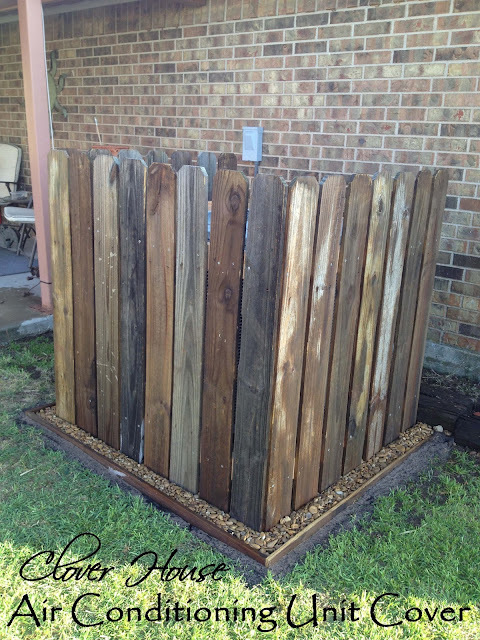 Have you figured out what you want to use to hide your AC?